The hotel’s lobby is being renovated this year. But that doesn’t mean guests have been made miserable; quite the opposite, in fact. 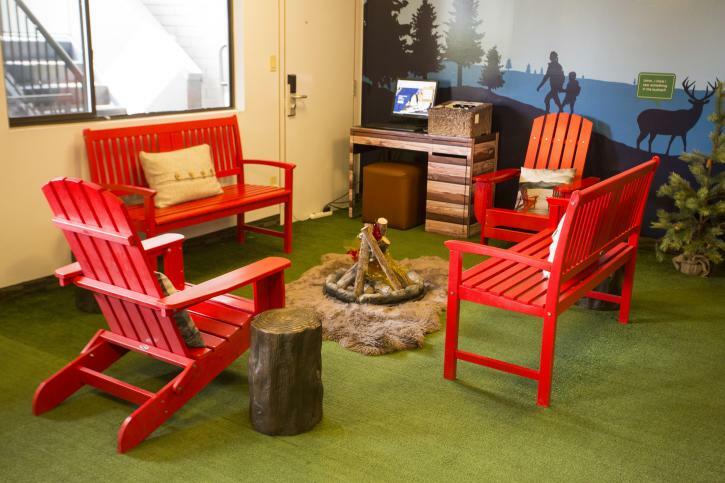 The temporary lobby has been creatively decorated with a campout theme, including fake grass, Adirondack chairs, and a make-believe campfire. Topping it all off is a front desk resembling a log cabin—plus special souvenir mugs that proclaim ‘I survived the renovation.’ The fun won’t end when the soon-to-be-finished reno is complete, though: they’re installing a permanent Lite-Brite wall in the new lobby to keep you busy while you await your (free) airport shuttle ride. Every room comes with its own friendly rubber duck toy and you’re encouraged to take it home, free of charge. Several different themed ducks are released each year—from rock stars to construction workers—and repeat guests have amassed some sizeable flocks for their bathtubs back home. Four new original ducks are about to be launched, including—you read it here first—a mad scientist. While the ‘Free flight simulator’ door sticker on the hotel’s guest elevator might be slightly puzzling and even a little alarming, it all makes perfect sense once you step inside. The lift’s interior has been decorated as if you’re riding in the basket of a lofty, multicoloured hot air balloon. Your view? A mountain-framed panorama of downtown Vancouver’s multi-towered cityscape, recreated in wraparound poster form. While some hotels have restrictive pet policies that aren’t much fun for travelling pooches, Accent Inns takes a more realistic approach to your furry family members. Two critters are allowed in your room with you (more if requested in advance); they can hop up on your bed to snooze; and you can even leave them alone in your room, so long as you furnish the front desk with your contact phone number. And while standard pet fees apply, $1 from each charge is donated to the BC SPCA. Like their in-room pet rules, they have a bicycle policy here that’s rooted in user reality. If you totally love your mountain bike and don’t want to let it out of your sight, you can bring it into your room with you. But before you slide between the sheets with it, you might want to clean the mud off first: the hotel has a dedicated bicycle cleaning station—with warm water—as well as handy tune-up gear to keep your wheels in tip-top shape. You’re not allowed to sleep with your motorcycle in your room, but this particular hotel is also very biker-friendly. If you’ve been on the road all day and you’re looking for the perfect overnight pit stop, there are dedicated lock-up stations and warm water cleaning areas here. And once your beloved Honda, Harley, or Norton is fully spruced-up, the front desk can supply you with a cover to keep it nice and shiny for tomorrow’s big ride. 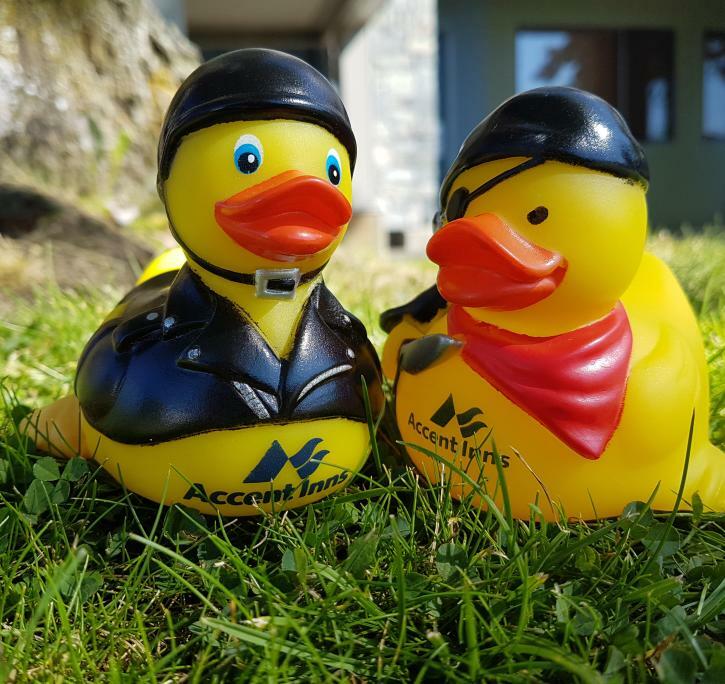 Repeat guests at Accent Inns win a special prize on their fifth sleepover—as if a gaggle of cool rubber ducks wasn’t enough incentive. On your fifth stay, you’ll find a bag of trail mix and a special bottle of beer waiting for you in your room. Exclusively crafted by celebrated Victoria-based brewery Phillips, it’s a tasty bottle of Inn-Dependent Pilsner—complete with an image of a jaunty duck on its label. Cheers! 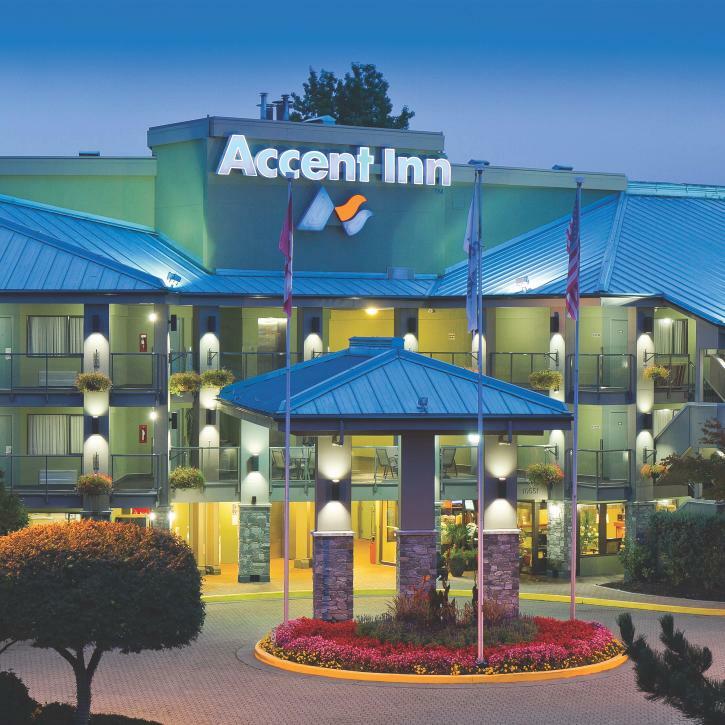 Interested in staying at Accent Inns Vancouver Airport Hotel? 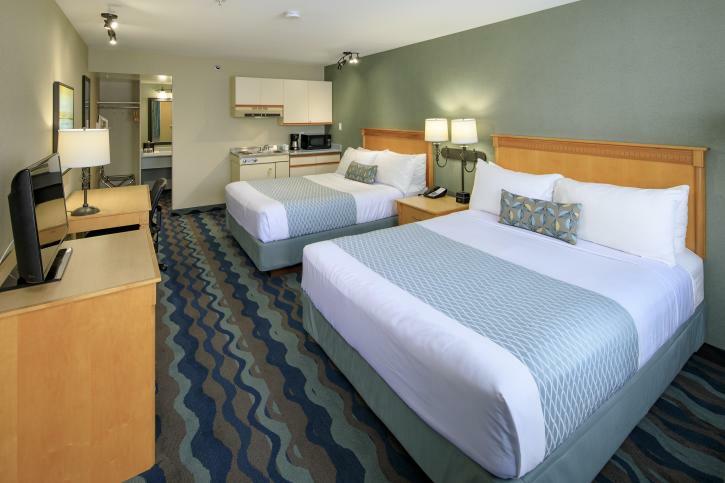 Check rates and book your stay here.